I am ambivalent about Marilyn Monroe. She was very pretty of course. After sliding home so many times for the Yankees it was only natural for DiMaggio to be well acquainted with her dugout. I could make a joke about JFK her and Irish Pillow Creme but I wont do because it’s national donut day. I’m saving that for later. Seriously, Ms Monroe had tons of accolades to her name which I will list as supplementary info for this post. However I would like to make a point, add a little bit of sugar to an open wound that has been festering for a bit. I’ve seen this quote so many times: If you cannot handle me at my worst, then you sure as hell don’t deserve me at my best.” This is a disconcerting quote given that it’s author couldn’t handle herself and died of a drug over dose. I am not trying to tarnish Ms Monroe’s legacy I am just wondering why so many people attach themselves to this quote. We are responsible for our actions even in cases where we are spiralling out of control. If I am a friend to someone, or in an intimate relationship with a lady, is it my job to “handle” that person? Whaddya think? Imagine a ‘Justin Volpe meme’ about how we should really trying to tolerate other races. Does anyone see the irony here ? Posted on June 6, 2014 by mrmarymuthafuckingpoppinsPosted in Personal Thoughts, reflections, Sexuality, Social CommentaryTagged Deserve me, handle me, Hypocrisy, Irony, Justin Volpe, Marilyn Monroe, Racial Issues, Sexuality. Yeah, no one is perfect, but if someone is regularly selfish, impatient out of control and hard to handle I’m not interested in hanging around to see what their best is. 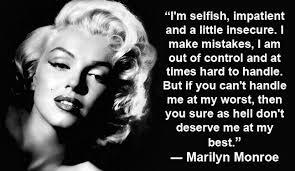 And I think I read somewhere that Marilyn Monroe never actually said that!